Perhaps the most majestic of all of our bedrooms, the Webster Room is named for the Honorable Thomas E. Webster, who was a prominent probate judge and the original owner of the home. 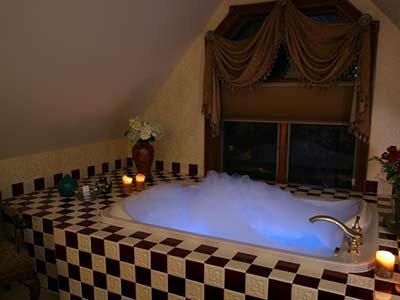 The room features a grand Jacuzzi tub with plenty of room for two, surrounded by intricate maroon and ivory tile work. 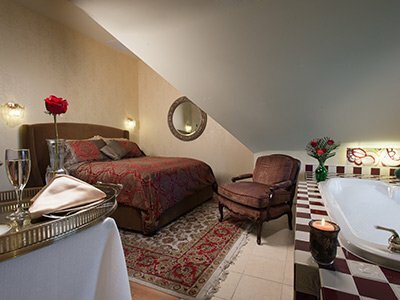 It is a beautiful room perfect for celebrating a honeymoon, anniversary or any other special occasion. Deep maroons and golds accent the room, which also features unique ceiling lines. A suede luxe contemporary feather-top queen bed with custom bedding, a towel warmer and flat-screen high definition television are among the room’s many offerings. A lovely writing desk can house your laptop, enabling you to connect to our high-speed Internet. 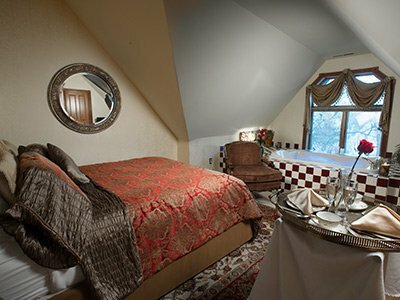 A private bath and separate sink and makeup mirror are the special touches we offer in this rich and inviting room. Turndown service, complimentary beverages, free wi-fi, in-house ironing and in-room massages are among the many amenities that will make this the most elegant stop during your travels.